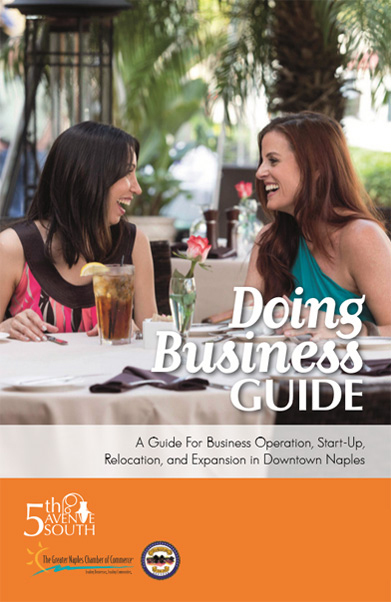 Downtown Naples is the ideal place to start or expand a business. The City of Naples, Fifht Avenue South Business Improvement District, Inc. (BID) and the Greater Naples Chamber of Commerce want to ensure that your business is successful for many years to come. The Doing Business Guide is an important resource to facilitate business development. The Guide highlights the basic tools and resources necessary to successfully operate, start-up, relocate or expand a business. Please note that information may change as ordinances, permitting processes, and fees are revised and updated. Users are advised to verify all information with the appropriate department, agency or organization. There are so many benefits to being a member of the BID including Marketing supplied to all Merchants and Businesses.